Watching This Is It, I felt like a cave person being exposed to fire, thinking, “Fire. Good,” because I lacked the vocab to adequately describe what I was seeing. This documentary of rehearsal footage for Michael Jackson’s tour-that-never-was gives an idea of how incredible the spectacle would have been. 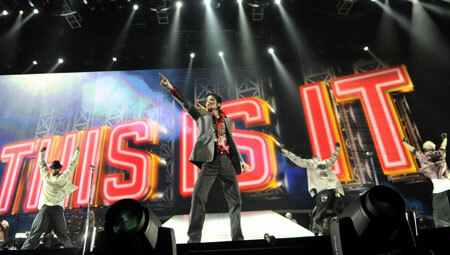 The pyrotechnics, props, and dancing are eye-popping, but the most amazing special effect is MJ himself. The man was a genius. He was not only able to visualize things most people can’t imagine, he had the talent and means to bring them to life. His passion for entertaining is obvious, the stage truly his home. It was moving to see how kind he was to his crew and how much he inspired them, how they loved him for it, and what a perfectionist he was without being a nightmare. He worked harder than anyone and the few times he disagreed with his musicians or director Kenny Ortega, he was respectful about it and always right. My favorite numbers were “Smooth Criminal” and “Thriller,” which incorporated Jackson into filmed segments leading into live performances. For “Criminal,” Jackson inserted himself into that signature scene from Gilda with Rita Hayworth singing “Put the Blame on Mame” and stripping off her gloves (Jackson catches one). For “Thriller,” he was reinventing the video in 3D. After more than 25 years of watching countless others perform that infamous monster dance, it’s quite, well, thrilling to behold the mastermind himself doing it again and see that he’s still got it. And that’s the thing—at 50, Jackson still had It, the ability to wow me and turn me into a little kid again. I can’t think of many entertainers from my childhood who can still impress my more cynical adult self. The sense of loss is slightly mitigated by the realization that Jackson will probably be with us for a long time, like Elvis and Marilyn. People will continue to organize “Thriller” dance-a-thons and new generations will attempt the moonwalk. The documentary’s title notwithstanding, I don’t think this is it for Michael Jackson. Believing the kid-molestation scandals or not, the man was a real entertainer, and a genious at that! Thanks PCN for the rave review! It’s inspiring to see how creative he was. Fans who bought tour tickets would have gotten their money’s worth and more. Movie tickets cost even less so it was definitely worth it for me. I would have been keen to watch this from the perspective of seeing behind the scenes and how MJ worked in rehearsals ~ but now, even more so. Thanks, PCN! I was fascinated by his creative process, Shell. He was like a savant. He knew every beat, sigh, note, riff, key, and move of his songs and numbers. If a musician was off by half a beat, MJ would hear it even if he was busy dancing and special effects were going off around him. At one point, when the “Smooth Criminal” filmed segment ended, cueing the start of his live stage performance, MJ stood holding a pose, not looking at the screen. Ortega asked him, “How will you know your cue?” MJ answered, “I will feel it.” That summed it up for me. He felt his music and it showed. I was hoping someone I knew would give a review of this. I’m glad to hear this was as good as it looked in the previews. Thanks, PCN. Do check it out if you get a chance. I think your kids would like it, too. I saw it yesterday, PCN, and I had the same reaction. I’m not a Jacksonphile, but I do love his music and wanted to see his creative process at work and get a taste for what he was like behind the scenes. I was dazzled. He was a genius and it’s on the screen for all to see…even if we can’t find the right words to describe it. The sad part was watching everyone working so hard to create a final product that would never be. I really felt for those people, too, Chris. All those dancers and singers who realized life-long dreams of performing with him, those costume designers who were researching new science to make him glow on stage, the badass blonde lead guitarist—they gave so much to the show and didn’t get to have their curtain calls. At least he treated them really well during the time they had with him. I got to see it the other day and was just amazed. MJ wasn’t just a incredible performer, he was a kind man as well. Just spectacular! And it was only a rehearsal!! I’ve heard several people really hype this now. It’s hard to imagine him NOT around given I literally grew up with him as an entertainer. Regardless of what happened along his path, he influenced many. And as you so eloquently put it, PCN, he still had IT at 50…and he started at 5. Just amazing!